Creating a website is like building a house. You should have all the materials ready before you start creating a website. You will save lots of time and money if you read this post in full before starting out your new website. 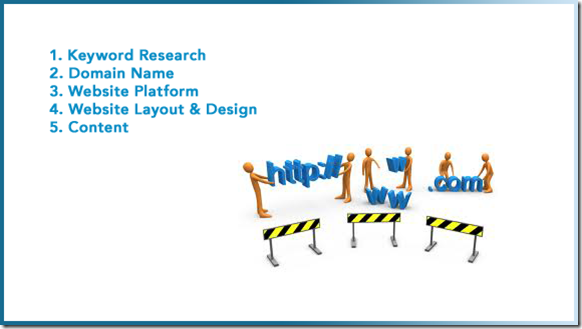 Keyword research is the foundation of your website. Solid foundation leads to reliable future success. Really important to select right keywords so you can compete in search engines and rank well to get traffic. Following points you should consider when selecting right keywords. After doing the right keyword research select your best keyword and get the domain name that includes that particular keyword. For example if your main keyword is “Estate Agent” try to get the domain name like estateagent.com. Chances are these sort of premium domain names will not be available, so you can try few different combinations such as estateagentuk.com, estateagentonline.com. I hope you get the idea? If not feel free to discuss in the comments section below. This is really important decision. You should decide which type of website you are planning to have. Traditional static website or regularly updateable website using software’s like wordpress. Your site’s conversion and success depends on the layout of your website. You can design this layout on a piece of paper or if you are technical person use photo shop or pay some one to do it for you. You should also have clear idea of number of pages you need on your website. Get the text, photos, videos and layout of these pages ready to save you money and time when creating your website. Your thoughts? Have a I missed any important point? Love to hear from you in the comments below.